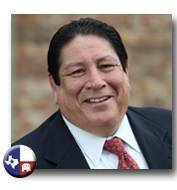 Daniel Chavez is a Republican running against Representative Henry Cuellar in District 28. Daniel was born in San Antonio and attended schools there until he moved to Austin in order to pursue his major in architecture at the University of Texas at Austin. Later in life, he attended St. Mary's University in San Antonio to study Political Science. Daniel's work experience is centered in project management and the coordination of projects. He is focused and driven toward accomplishing goals and the completion of projects within required time frames and budgets. He has worked on large projects in Alabama, California, Mississippi, Texas, Utah and Virginia and has dealt fairly with all parties involved. He believes in the people of the 28th district and the rest of the country and is glad to stand up for the freedoms of all. In 1987, he was involved in a high profile auto accident on a downtown freeway in San Antonio. As the 18-wheeler dropped onto his vehicle, he didn't think he would survive. Today, he is grateful to see his children's smiles and hear their voices. He is dedicated to providing a great life for them and wants to leave them a better place to live. Daniel has recently said, “We are becoming a socialist state with the government providing everything for us. It’s time to wake up. We are losing our country." But Daniel believes our country deserves a second chance to succeed. He believes in the strengths of Americans and the ethics of hard working Texans. He truly wants to make a difference and believes that now is the time to listen and work for the people of Texas and America together. Daniel Chavez currently lives with his family in Mission, Texas where they attend the Church of Jesus Christ of Latter Day Saints. Spread the word about Daniel Chavez's campaign. You can also find Daniel Chavez on Facebook.